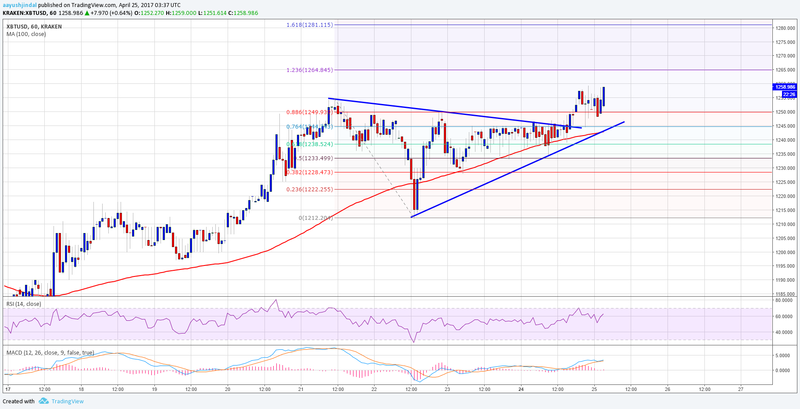 Bitcoin Price Analysis: BTC/USD To Surge Higher? Bitcoin price maintained its bullish bias above the $1240 support area against the US Dollar, and now BTC/USD is looking to extend gains. There was a crucial contracting triangle pattern with resistance at $1245 on the hourly chart of BTC/USD (data feed via Kraken), which was broken to ignite an upside move above $1250. The BTC to USD remained elevated above the $1220 support, and traded above the $1240 level. There was a nice upside wave before the price settled above the $1240 level. The price first broke the 50% Fib retracement level of the last decline from the $1255 high to $1212 low in order to gain pace. Then, there was a break above a crucial contracting triangle pattern with resistance at $1245 on the hourly chart of BTC/USD. It resulted in an upside push above $1244 and the 76.4% Fib retracement level of the last decline from the $1255 high to $1212 low. Now, the price is heading higher and remains well above the 100 hourly simple moving average at $1240. If the price corrects lower, the broken triangle resistance at $1244 may now act as a support and prevent losses. Moreover, the 100 hourly simple moving average at $1242 might also act as a barrier for sellers on the downside. If the current momentum stays intact, there is a chance of a move towards the 1.236 extension of the last decline from the $1255 high to $1212 low at $1264. If the BTC buyers take control, there is even a chance of it moving towards the $1280 level in the near term. The hourly RSI for BTC/USD (data feed via Kraken) is currently well above 50 level, and signaling positive signs and gains. Previous story What Really Are Bitcoins? Is It Legal To Use It As Money?